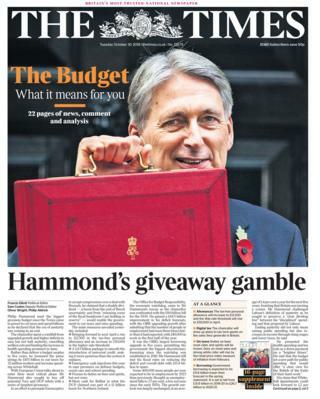 “Hammond’s giveaway gamble” is the headline in the Times, which says the chancellor went on a spending spree in the Budget, as he declared the era of austerity was coming to an end. 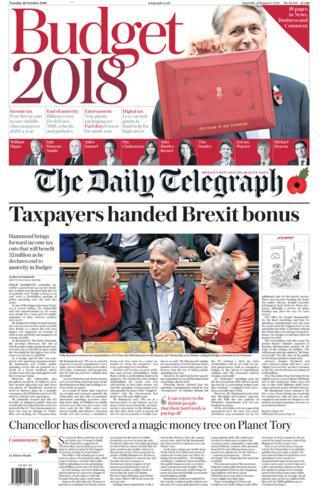 The paper reports Philip Hammond loosened the purse strings in tax cuts and increased spending across Whitehall, which will equate to £103bn in extra government spending over five years. But the Times adds the injection of cash is in lieu of running a budget surplus over five years. 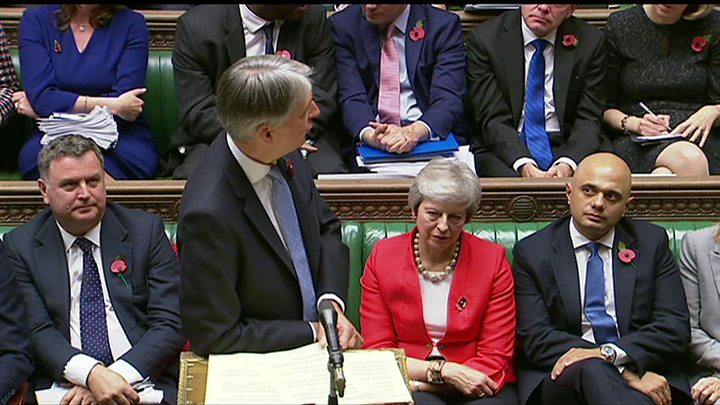 The Guardian says Mr Hammond’s Budget was used to “shore up” Prime Minister Theresa May, after she promised an end to austerity in her party conference speech earlier this month. The paper says the chancellor also “met colleagues’ demands” to cushion the impact of Universal Credit, with a £1,000 a year increase in the amount claimants can earn before benefits are clawed back. The Daily Telegraph calls the chancellor’s announcement “one of the biggest giveaway Budgets in recent history”. The personal allowance, the rate at which people begin paying income tax, will now rise to £12,500 in April. And the threshold for the higher rate of income tax will rise to £50,000. 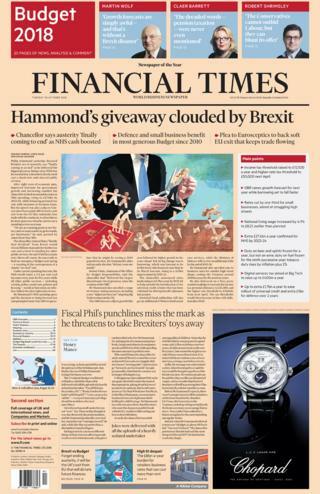 The Financial Times says Mr Hammond warned “that a disorderly Brexit could cast a cloud over cash-starved public services”. The paper adds the chancellor made a plea to Eurosceptics to back a soft Brexit that keeps trade flowing between the UK and the EU. 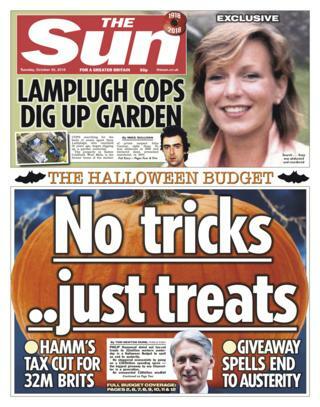 In recognition of Halloween, the Sun hails Mr Hammond’s Budget as “No tricks, just treats”. It says taxes will be cut for 32 million people. 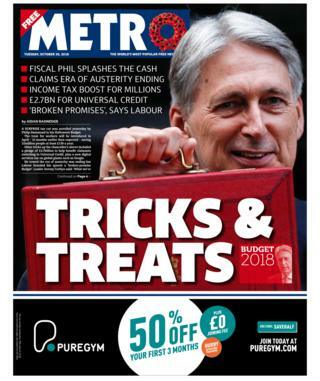 In a similar Halloween vein, the Metro says the chancellor’s Budget was both “trick and treats”. It says tricks up Mr Hammond’s sleeve included £2.7bn to help benefits claimants switching to Universal Credit, while he treated workers to a tax cut by raising the personal allowance. 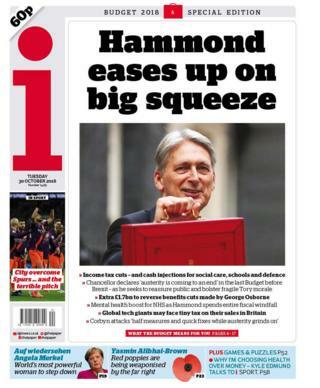 The Mirror is far more pessimistic about the Budget. “Is that it?”, asks the paper in its headline. In a breakdown of the figures, it says the £400m extra given to education is not enough for one teaching assistant per school, the £650m given to social care does not supplement the £1.3bn cut from local council budgets, and nothing was offered to help “fight record crime levels”. “Phil-good factor” is the headline in the Daily Mail. 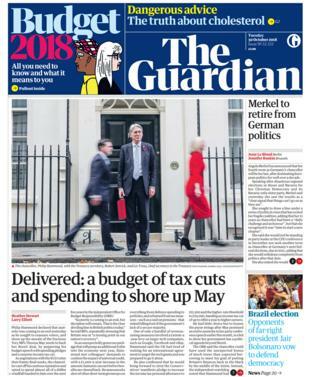 The paper says the budget was a “dramatic shift in strategy” for Mr Hammond, and beckoned the biggest increase in public spending since the 2008 financial crash. The i says the Budget offers cash injections for social care, schools and defence. It adds that an extra £1.7bn has been set aside to “reverse benefits cuts made by George Osborne”. 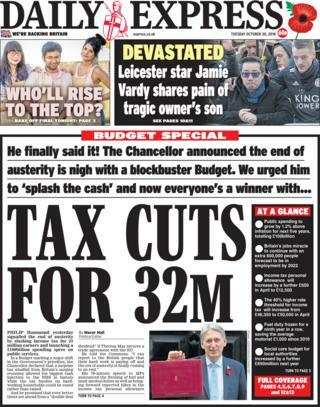 The Daily Express leads on “tax cuts for 32 million”. It also reports Philip Hammond promised that even better times are ahead from a “double deal dividend” if Theresa May secures a trade agreement with the EU. The Budget is the main story on many of the front pages, with coverage taking up many of the inside pages too. The Metro says it was a Halloween Budget of tricks and treats. For the Sun however, there were no tricks, just treats. “Nice one Chancellor,” the paper declares. In the words of the Times, it was a crowd-pleaser of a Budget, with something for everyone. Philip Hammond jettisoned any claim he had to prudence, it says. The Daily Express describes it as a blockbuster Budget. The Guardian found it an unexpectedly generous package in which the chancellor sought to reassure voters and shore up the morale of the fractious Tory MPs whom Theresa May needs to back her Brexit deal. According to the Telegraph, the biggest giveaway Budget of recent times represented a genuine change of direction, a final rupture with the George Osborne years. The paper’s commentator, Allister Heath, says gone is the idea that the Treasury’s priority is to balance the books. It seems there is, after all, a magic money tree, and Mr Hammond has discovered its existence even on Planet Tory, he adds. The Mail says Mr Hammond unveiled a spending spree in a bid to end austerity and prepare the UK for life after Brexit. 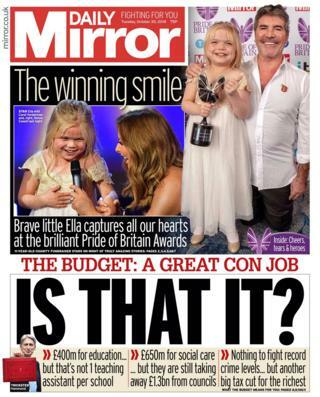 For the Mirror, the Budget was a great con job. “Is that it?” its headline asks. The paper complains that the £400m for schools in England won’t be enough to pay for even one teaching assistant per school. It adds that there was nothing to fight record crime levels – but there was another big tax cut for the richest. Finally, if the papers are divided about the impact of the Budget, there’s no dispute over Philip Hammond’s jokes – they were terrible. The Sun says his “dad” jokes had MPs cringing. Macer Hall, in his political sketch in the Express, says his attempts to lighten the load with a few gags failed to tickle MPs and triggered audible groans around the Commons chamber. For the Financial Times, the chancellor delivered his jokes with all the aplomb of a heavily-sedated undertaker. According to the Guardian’s John Crace, they fell stone dead. The Guardian says English Heritage has admitted that not enough women from history are celebrated with commemorative blue plaques. The paper reports that only 14% of the more than 900 blue plaques in London are dedicated to women. They include the computing pioneer, Ada Lovelace, the DNA scientist, Rosalind Franklin, and the first woman to sit in Parliament, Nancy Astor. English Heritage tells the paper it’s seeking the public’s help to nominate more women, especially in the areas of science, sport and fine arts. ← US mail bombs: Who is George Soros?